Bill: Kano gives the following diagram as a Black error (diagram 2, p. 20). Indeed, Black has erred, but Kano blames . 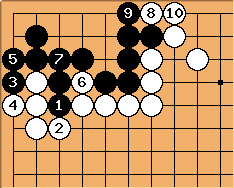 Kano ignores the fact that and are miai, and that Black's error is . 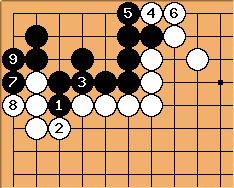 Kano then shows this diagram (diagram 3), for Black to get tedomari. at is better technique, but Black can still get tedomari with . also gets tedomari, and - is technically correct play. - is usually wrong. As it has an atomic weight of 1, Black should normally let White play on those points. But in this case it is the technically correct play, because and are miai, and cancel each other out. Note: , -- and, in fact, the whole play --, shows that Kano assumed that the surrounding area was White's territory. See Assumptions of Yose Problems. The diagrams are on the subject of Miai and Tedomari. What the book says is that there are three 2-point gote plays in the starting position. Because is sente by itself it may look attractive to play it and then turn away. However this is incorrect thinking as has become a forcing move that will give White tedomari as shown above. The correct play is to take one of the three 2-pointers, leaving the other two as miai (the example in diagram 3 in the book is playing the upper side hane and connection, leaving the other two plays as miai). Still, if Kano regarded treating as sente as the problem, why not give the Technically correct diagram in the book instead of the Tedomari diagram (which I just now posted)? That diagram suggests taking one of the two miai instead of the remaining play. 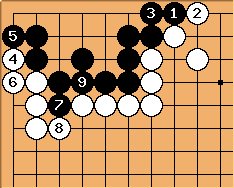 As it happens, Black can still get tedomari, but canceling out the miai plays is the right way to think about it. Dave: Kanno never analyzes the position. He uses it to show one example of incorrect thinking and moves on. Since the points you raise are valid in a larger sense, I suggest you rename the page and link it into other relevant material on SL. It does not belong in a list of errata since: (1) technically it isn't and (2) people who are interested in the subject will not normally find it. 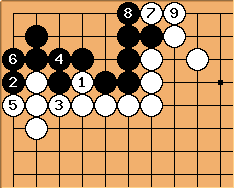 Kano regarded the middle play as gote. That is problematic, but he did not have the concept of ambiguous play. is not gote. If Black ignores it he gives White one more point.